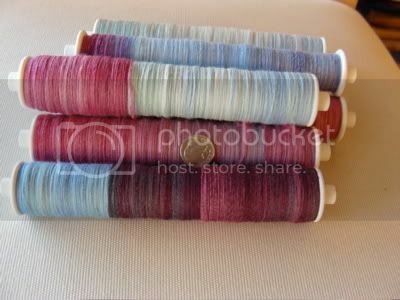 Jocelyn asked last week, amidst my chaos, how I prepare my roving, etc, before spinning. This depends on what my project is, and how the roving has been prepared. The Royal Hare roving (that I’m spinning for socks) comes in tidy braids that are even thirds. 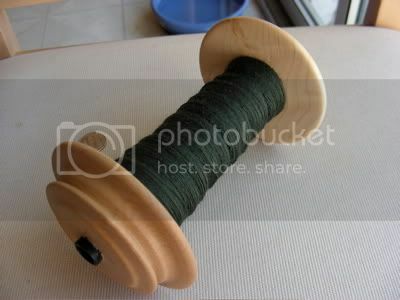 I spin those, as is, since I like 3 ply yarn for socks. With other rovings (that come in a ball) I usually weigh out a third of the total weight (or and sixth of the total weight, if it’s Crown Mountain). From there, I spin them on three separate bobbins, let them sit (at least overnight), ply them, let them sit (overnight), set them in the sink, let them air dry, label them, and either knit them or put them in the Big Bag o'Handspun. If I’m spinning for a larger garment, I’ll weigh out my roving into 1 oz bumps, spin them up, let them sit, and then wind them off onto the smaller plastic bobbins. I use the longest length- 6”, and I can comfortably fit 1 oz per plastic bobbin. I use the plastic bobbins mostly because a bobbin for my wheel costs (approximately) $32, and each plastic bobbin costs (approximately) $1.15. 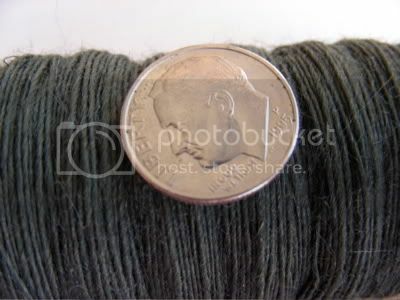 If a Schacht bobbin holds 4 oz of spinning, and each plastic bobbin holds 1 oz of spinning, the difference in cost is huge- especially if you’re spinning a pound or two. Once the total needed weight has been spun (note that this doesn’t always mean “all of the roving/fleece I have in that color”), I ply everything at once. This makes the end result more consistent- stuff I spun last year is bound to be (at least) a little different than the spinning I’m doing now. Another benefit of the plastic bobbins is that if one bobbin has a little more or a little less yardage, it is more easily corrected. So, for example, here is some Merino that I bought from Judy’s Novelty Wool at Stitches West 2007 for a sweater for myself. These have been resting for a while, waiting for me to finish spinning and then whip out a sweater. I’ve also started a vest for Andrew- it’s an Olive-y green BFL from Ashland Bay (“Fir” is the color). It may not look like much now, but it will get more exciting. I think I've asked this before, but can I be you when I grow up? I hear ya on the costs of bobbins, winding off is a good thing and I like how you "homogenize" your end product. Very nice. Where do you get the plastic bobbins?